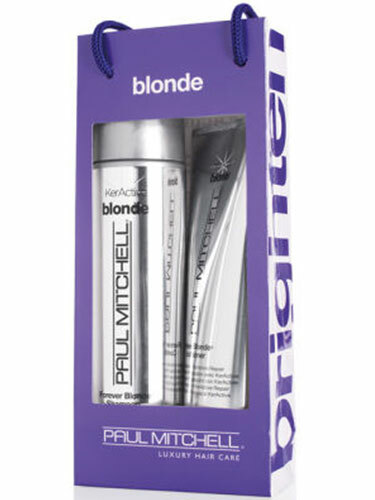 The first system from Paul Mitchell® specifically designed to care for all blondes, these protein packed products are guaranteed to make any blonde shine. This sulfate-free shampoo helps soften and strengthen as it cleanses. The exclusive KerActive protein hugs every strand to guard against breakage, while Safflower oleosomes help restore lost moisture and elasticity. Special botanicals including turmeric, chamomile and lemon peel help keep blonde hues light and bright. Give fragile blonde hair the moisture and strength it needs every day, while subtly brightening blonde and highlighted hues. Rich conditioners, including macadamia nut oil and Safflower oleosomes, deliver hydration right into the hair shaft for improved elasticity, softness and shine. KerActive protein hugs every strand to protect, smooth and help repair damage.